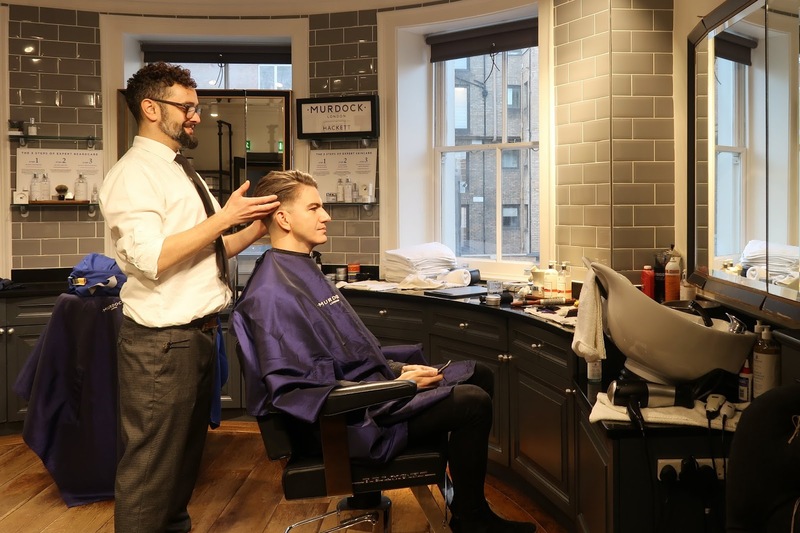 A trip to the barbers for me is one of life’s little pleasures, so when Murdock London invited me to review their King Street Covent Garden branch I was more than happy to oblige. I was also in need of a fresh trim ahead of the Vuelio Blog awards so the timing could not have been better! Murdock King Street is situated in an old town house above the Hackett Store in Covent Garden. 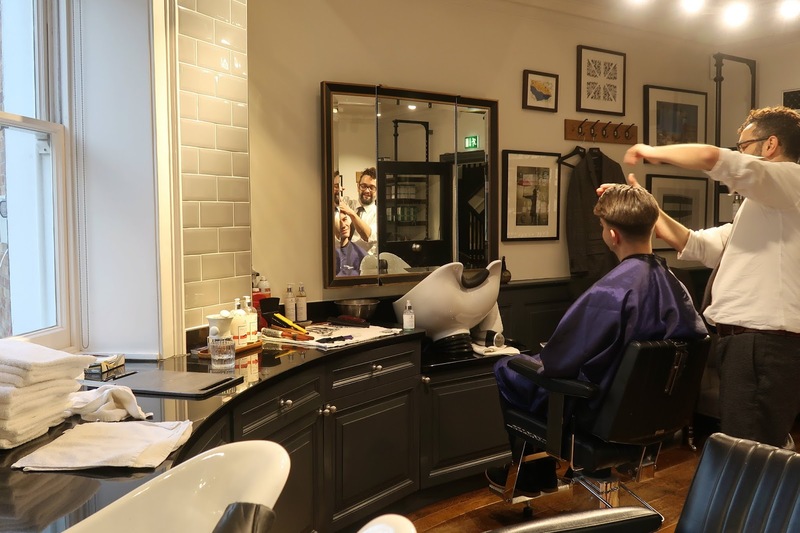 They have a range of treatments on offer, from a back and sides trim to the full service which includes shampoo and haircut, wet shave and signature facial. Upon arrival you can relax with a drink – whisky and beer is on offer which is always a good thing in my opinion! 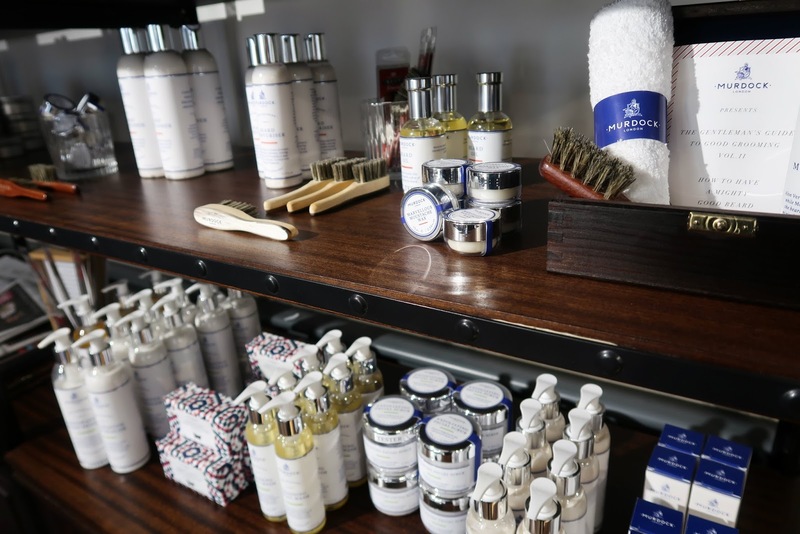 I had a coffee and had a good look at all the grooming products they stock. (more on that later). Onto the cut – I opted for ‘the haircut’ – which lasts 45 minutes (good to know if you’re visiting on you’re lunch break) and involves a shampoo, condition, haircut & style. It started with barber Alex (who is Murdock’s Master Barber) discussing with me how I wanted my hair. Now this stage of any trip to the barbers is absolutely crucial to me because I’ve learned from experience that this conversation can make or break the results you end up with! If I’m simply asked ‘what we doing?’ and they don’t ask any further questions when I tell them how I usually have my hair cut, then alarm bells start to ring! Thankfully this wasn’t the case with Alex. He went into detail with how I wanted it look, what sort of length, how I style my hair, how my hair behaves, what products I use and talked through the various options with me. Most importantly, I felt like Alex listened to what I was saying and asking for, and responded accordingly with suggestions for the cut and style. Next up was a shampoo. 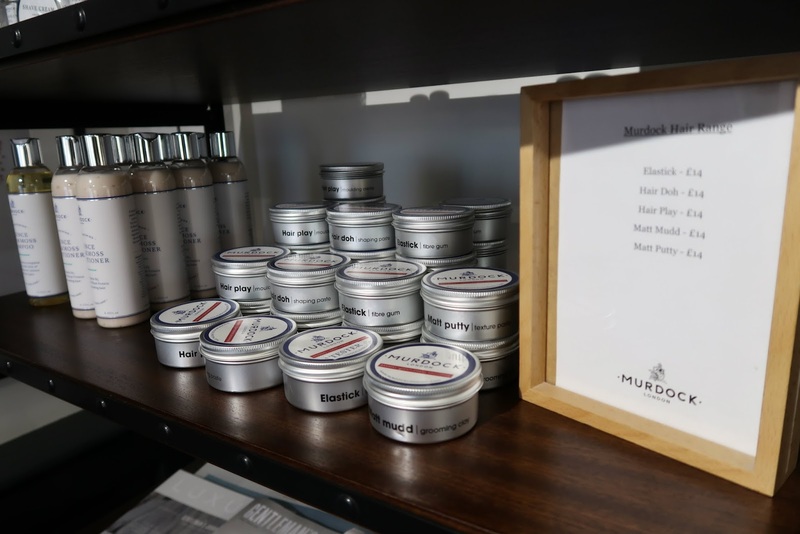 The Quince & Oakmoss shampoo smelt amazing – it’s part of Murdock’s own range – and contains Wheat Proteins to strengthen and repair and Aloe & Oat to add shine and softness. Because my hair is naturally poker straight, I’m quite specific in what I find works for me in terms of style. If my hair is cut too short on my crown or at the sides it will stick up and out, and be difficult to style. I went for a 0.25 low fade, and kept the length on the top. During the cut Alex continued the conversation to ensure I was getting what I wanted, from details like whether I wanted it to be thinned out in certain areas and exactly how much length I wanted taking off – much appreciated! And I felt totally at ease to chat away throughout the cut. I know that some people prefer not to chat when they are in the barbers chair – while others absolutely love to discuss their entire lives! Personally for me it depends on what mood I’m in! One thing that is an absolute no no is the lad banter you can experience in some barber shops where it can seem like they are more focused on dissing one another’s football team than then job in hand, which certainly wasn’t the case at Murdock. The other thing I like about Murdock is the booking system. 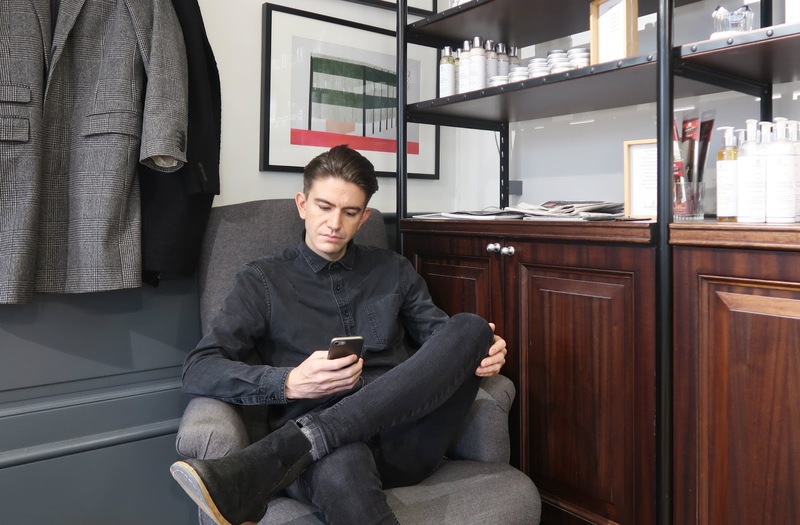 You can book your appointment online, and with times slots being clearly allocated it means that you can fit your hair cut in around you day (I imagine Murdock would be perfect for anyone that works in town who wants to fit their hair cut into a lunch break or straight after work). Alex blow dried my hair into shape and then added the Murdock sea-salt spray to add texture and hold before blow drying it a second time. This is something I haven’t tried before but definitely a technique I’ll be using in the future. Again, the conversation continued so when I wasn’t sure about a side parting Alex responded accordingly and adapted the styling to suit me – before adding Murdock’s matt mud to hold it in place. 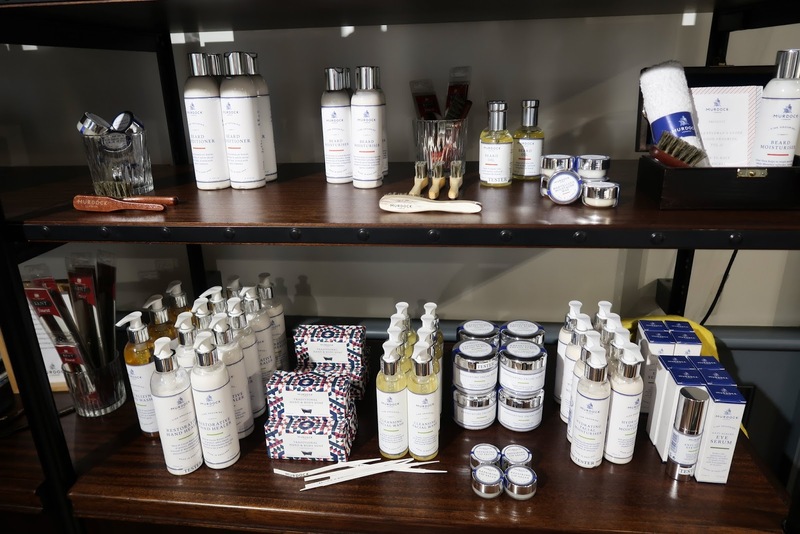 My trip ended with a spritz of their signature fragrance (they stock 7 different British cologne’s inspired by global travels) which have that soapy, traditional barber shop warmth to them. 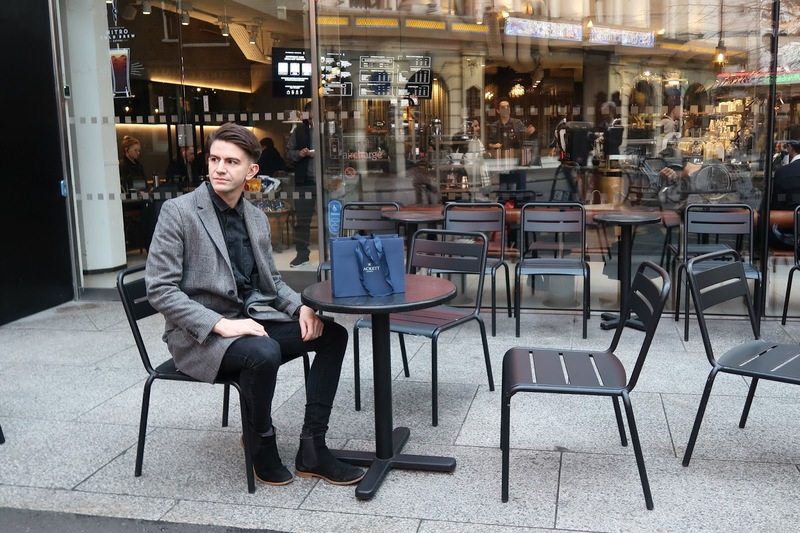 I thoroughly enjoyed my visit to Murdock King Street and found the experience really relaxing and enjoyable. I was really happy with the cut and it’s been easy to maintain the style since, I’d recommend trying them out if you are in London. (they also have several other stores across London, and one in Paris). *This haircut was gifted to me for review purposes, all opinions my own.